This integration makes prospecting and outbound sales easier. Find a targeted account or build a list of targeted leads, then enrich the data with Lead411. Easily drop your account or list right into a PersistIQ sales campaign with one click. From PersistIQ, launch a highly personalized multi-touch campaign in minutes. Lead411 is a lead intelligence platform that provides you with more insight into targeted accounts and contacts. It cuts down on researching time and gives you more time to sell! Narrow your results using search criteria such as title, industry, funding, hiring plans and more. 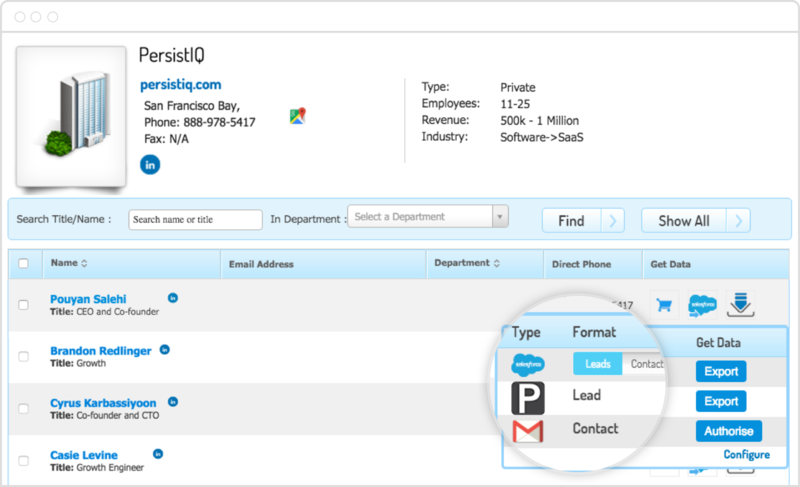 Push entire accounts or selected contact into a PersistIQ campaign with the click of a button. Without ever leading Lead411, you can push accounts or contacts into any outbound sales campaign or add them to your general leads database to follow up with later.